A quick reminder that Video Highlights, Goal Updates and more as much as possible via Twitter, Facebook and Instagram. The Korean Cup started earlier this month with a mixture of K3 League, University and Amateur sides entering, they’ve been reduced down and are joined by the Professional sides from the Korean National League and K League Challenge in this 3rd round stage of the competition. The big boys from the K League Classic join next month in the 4th round. Key – Blue = K League Challenge, Green = National League, Red = K3 League, Black = University. The tie of the round is of course Seongnam FC vs. Suwon FC in the only all K League Challenge clash. 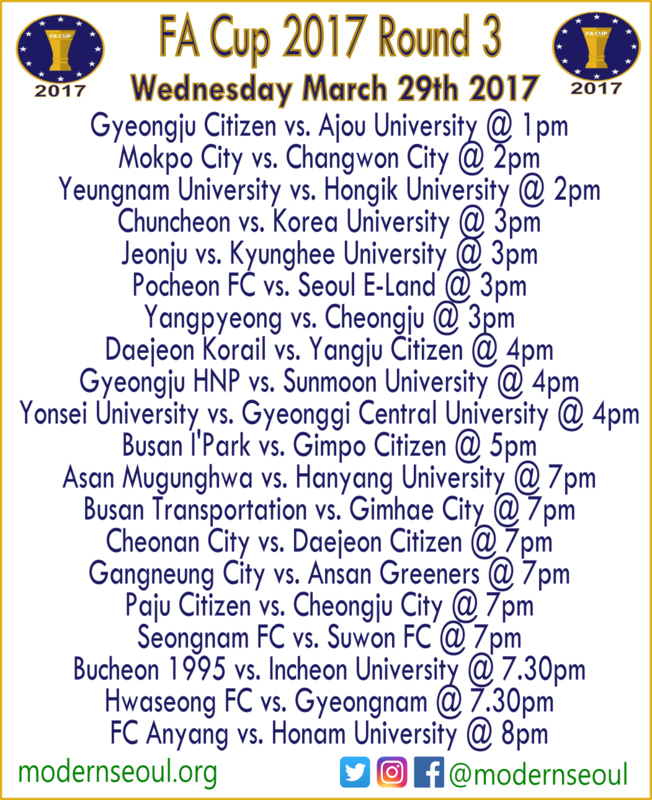 Other big games are Pocheon FC vs. Seoul E-Land and Ganggneung City vs. Ansan Greeners. Sadly due to the number of fixtures and a lack of information on each side it’s difficult to write predictions or previews for each game at this stage of the competition.